What is the Rhynie Chert? Chert is a sedimentary rock comprised primarily of very finely crystalline silica minerals, mainly a number of varieties of quartz. Some cherts are formed from the accumulation of siliceous animal remains such as radiolaria, diatoms or sponge spicules. Most, however, are formed by chemical precipitation from silica rich fluids either within or replacing pre-existing sediments after they have been buried, or more rarely as a primary surface deposit. The 'Rhynie chert' falls into this last category and was originally deposited as sinter from ancient hot springs. It is a rather unusual variety of bedded chert of predominantly dark blue-grey colours that is of Early Devonian (Pragian) age, between 400 and 412 million years old (see inset right). The most remarkable feature of this particular rock is that it contains exceptionally well preserved fossils of some of the earliest plants and animals to colonise the land. Right: A polished slab of the Rhynie chert. This shows a vertical section through a chert bed displaying horizontal wavy laminae with occasional beds containing fossilised upright plant stems (centre). The 'Rhynie chert' is located near the village of Rhynie in north east Scotland, a village approximately 50km north west of Aberdeen (see insets below). The rock itself does not naturally outcrop at the surface. 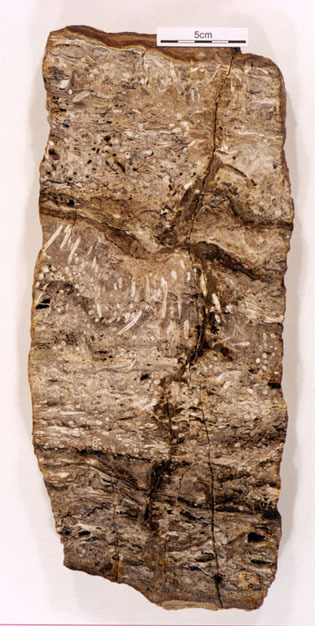 Most fossiliferous chert has been found as loose blocks within the soil. The chert has been located in situ by trenching at various times, and more recently by drilling and coring during 1988 and 1997. 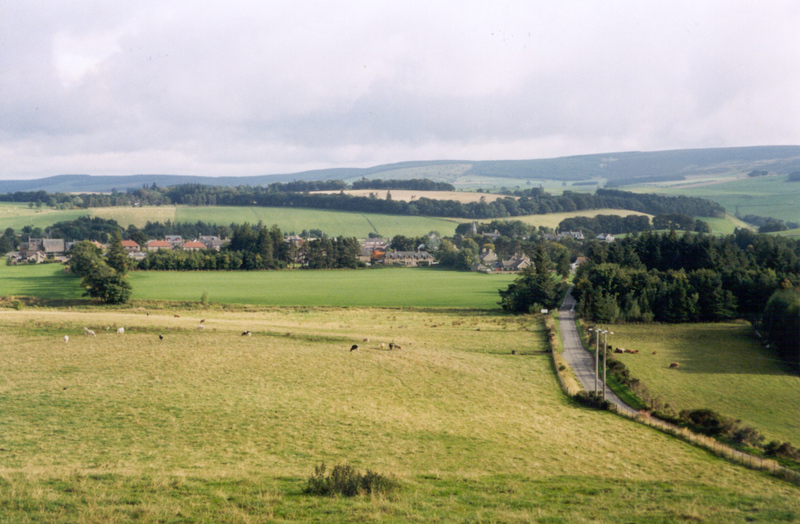 Above: Rhynie village looking southeast across the Rhynie chert SSSI (field in foreground). 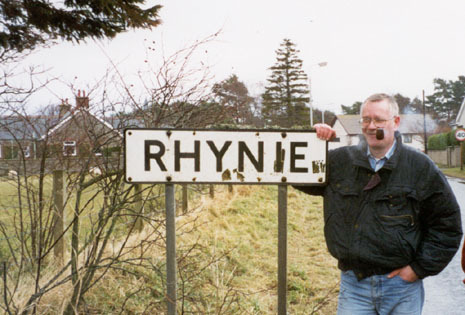 Right: Locality map for Rhynie, N.E. Scotland. 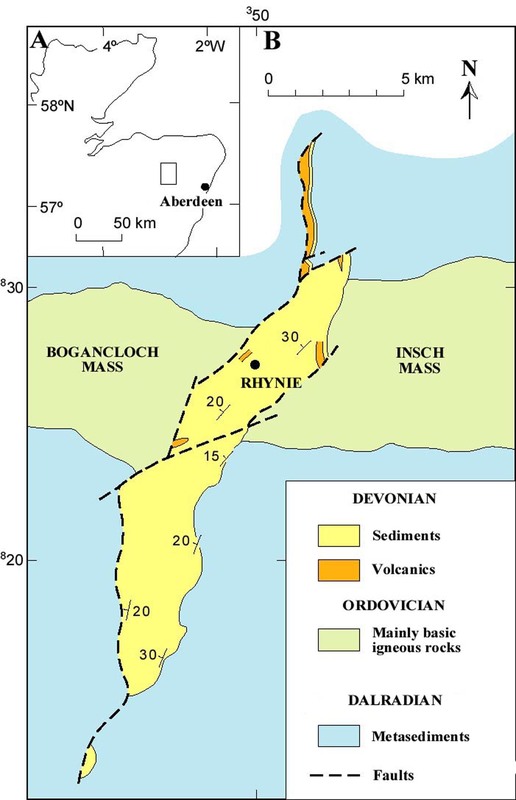 The Rhynie chert occurs towards the top of a sequence of Devonian sediments in a narrow basin which sits on older igneous and metamorphic rocks (for a close up map of the geology of the Rhynie area see the section on Geology and setting). Why is it important to science? There are a number of factors that give this rock its celebrated status! The most important is probably the preservation, in remarkable detail, of an Early Devonian terrestrial and freshwater community of plants and animals, together with bacteria and fungi. The plants are sometimes preserved in such exquisite detail that their internal anatomy can be described. They are the best preserved land plants known from 400 million or more years ago and as such form a cornerstone of palaeobotanical studies. The animals represent one of the earliest and certainly the best preserved terrestrial fauna known from the Devonian. Recent finds make this the most diverse associated fossil arthropod fauna of terrestrial and freshwater origin from rocks of comparable age anywhere in the world. The Rhynie cherts are part of the surface expression of an Early Devonian precious metal-bearing (contains minor gold) hot-spring system. This is the oldest hot spring system known where surface features such as geyser vents are preserved anywhere in the world. For a short period in the Early Devonian there were hot springs and geysers at Rhynie. The waters contained dissolved silica, and when the erupted water cooled amorphous silica was deposited in the form of sinter. Some of the silica coated and trapped plants and animals on the land surface or within shallow ponds, and the organic structures were mineralised (see inset right). Burial of the sinters over millions of years resulted in deposition of more silica and the eventual conversion of sinter to crystalline chert. 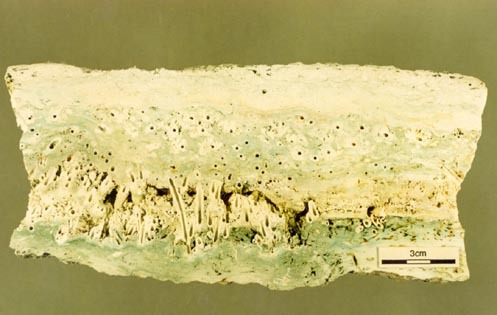 Above: A polished slab of recent sinter from New Zealand showing upright moulds of plant stems coated by amorphous opaline silica. 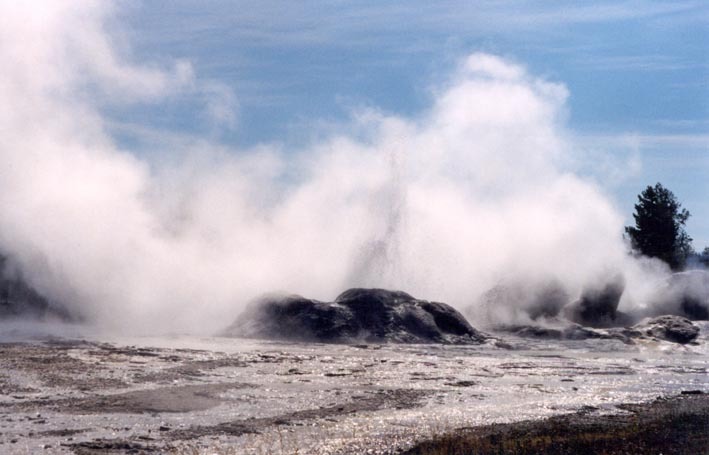 At the present day hot springs depositing siliceous sinters occur in many areas, notably Yellowstone National Park in the USA, and near Rotorua in New Zealand (see insets right and below right). Right: Geysers in eruption at Yellowstone National Park. Precipitation of amorphous silica from successive eruptions and outflows of hot water create 'cones' and sheets of sinter around the vent. 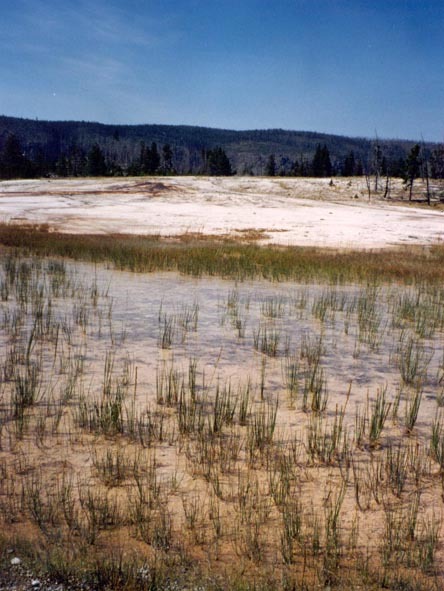 Right: Ponded run-off from Daisy geyser (middle distance) in Yellowstone National Park, creating a localised wetland habitat on a degraded sinter surface colonised by plants.